The war between stereoscopic purists who insist on filming with two cameras and those that prefer the control and convenience of 2D-to-3D conversion could soon draw to an end with the best of both worlds in the form of the hybrid Tri-focal camera system, which IBC Big Screen audiences were offered a sneak peak of. Howard Lukk (formerly with Disney & Pixar, now Director Pannon Entertainment, USA) bounced up to stage to give brief introduction and why when he was at Disney they got into it. Having worked on the tech side of Hanna Montana/Miley Cyrus they quickly became aware of the problems and limitations of shooting native 3D. “I was awfully jealous of the guys at animation who could render it out in 3D,” he confessed. “Is there a new paradigm,” he asked, and that is what lead to it. At the same time Fraunhofer was working on a camera that pointed the way to hybrid 3D, with a prototype Arri with two side cameras. The Gen 3 camera was the one taken out into the real world (Berlin, if you will) and shot the short film that we were about to see. Johannes Steurer (Principal Engineer, Arri Cine Technik, Germany) next took to the stage to explains how Arri came around to “stereo unaware” solutions with hybrid 3D based on the Alexa camer. Primary camera = established cine style digital camera. Two auxiliary cameras = small leightweight non-intrusive. Synchronized recording of all three camera streams was critical. Coarse alignment by mechanical adjustment, fine alignment took place by stereo analyzer software (STAN). (Too much technical detail to do it all justice. 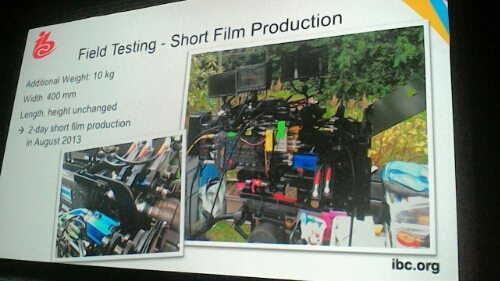 Hopefully Arri will publish a white paper for those interested). He concluded with a picture of the camera, which at 10 kg wasn’t (yet) significantly more elegant than native 3D cameras. Ralf Schefer (Head of Image Processing & Interactive Media, Fraunhofer HHI, Germany) talked about how a virtual stereo pair is generated by DIBR (depth image based rendering). Depth estimation takes place with trifocal input with four initially estimated sparse disparity maps. He then showed the final result with rendered stereo image. Howard then introduced the short film ‘Make Believe’, shot using the tri-focal camera. It was a sweet and fun film about the power of seeing your dream come true. The film cleverly demonstrated the versatility of the camera in a variety of situations and shooting conditions, with the stereo 3D holding up extremely well. Howard said that the film had the usual problems of an film shoot, with the lead actress suffering a nervous meltdown in the first hour of shooting. (Not Katherine Heigel but an 11 year old German girl who spoke no English, with Howard the director speaking very little German). So impressively, as it was shot over just two to three days, they ended up having to shoot everything on the second day with steadicam. At the panel discussion afterwards Sonke Kirchhof (Stereographer, reallifefilm, Germany) and Torsten Schimmer (DOP, Tectum, Germany) discussed how they got involved in the project and what their thoughts were about the new way of working. “Torsten said “it takes away a bit of responsibility that you normally have on set” with respect to a 3D productions, with the rendering done later. Howard interjected that it wasn’t completely “stereo unaware” as they knew it was going to be 3D as they planned it, but then shot it in 2D (or rather, hybrid). Sonke said that there you didn’t need a DOP and stereographer on set in the traditional set, but you have a stereographer in a diffeent capacity. They went very realistic on lighting, with lots of lights from the outside. Howard confessed that they did have an extra person on set, watching the secondary camera, though this will probably done different in future shoots. Ralf said that this could find particular use in television, where he felt that it is not economically viable to do native 3D shoots. Sonke observed that while there might be savings in production costs, there is still major developments that are needed in the post-production process for conversion. So while promising, it is still early days for tri-focal. Johannes admitted that the camera used (3rd Gen) was over-engineered (laugh of recognition from the audience, familiar with Arri’s German dilligence) but intentinally so, in order to then improve it. “There is a lot of improvements possible. There are lots of things that could benefit from depth mapping,” he elaborated, “not just 3D but also 2D produtions for things like visual effects,” he elaborated. Johannes said the response has been very encouraging from the visual effects community. An unrecognisably beardy Kommer Kleijn from the audience admitted to being worried by cameras like this, if it leads to people thinking that stereography awareness is not required on set. He then asked how much information was ained from the satellite cameras. Howard said 30-40% was gained from the satellite cameras for stereo conversion. He pointed out in the credits how many people were involved from StereoD to do the conversion. “We need better secondary cameras, and that’s not to fault the manufacturers of the cameras,” because an awful lot is being asked from them to keep up with it. StereoD said they could shave 30% off the time for the 2D-to-3D stereoscopic conversion thanks to this process [a headline number, if any]. The question was then raised about live 3D use, but this was too much early day and could at best be done for preview. And with that the panel wrapped and the panelists were no doubt about the be mobbed by those keen to know more about and also try the system.